Aspiring to design in a product team? Drop your one day side project and stick with something for a year. There’s limited value in 365 half-baked thoughts, but lots of learnings in one big success (or failure). This article is really aimed at designers aspiring to design digital products but other creative types may find it useful too. To set this in some context, I trained as a ‘graphic designer’ — in fact my first job was designing expensive coffee table books. I quickly moved into the world of digital marketing, working on big brand campaigns before jumping again to where I am now in a product team. The subtleties of my changing job title to me represent chasmic shifts in what I do on a day-to-day basis. Due to my slightly unconventional route to where I am now I’ve learnt the hard way how different the skills are that each discipline requires. Alongside this I started a side project in 2009 that is still going strong and has spawned several other interesting opportunities. In fact I would attribute a lot of what I’ve managed to do to experience gained from running a small non-profit. A lot of designers get bundled into one pot, which in ‘product-land’ we might call visual design — making stuff look pretty. For the aspiring visual or graphic designer access to showcases of good work are easy to find, from Dribbble to Behance and Brand New to Creative Review (as well as the visual design of every website and app around). What isn’t at all obvious is the design process that lead these people to their final execution. By their visual nature these showcases form the accessible face of the design process and therefore the easiest to understand and emulate. This natural bias isn’t a problem for the majority of designers, agencies etc., but it makes hiring a designer into a product team really hard work. Designing a product emphasises the end user more than any other design discipline — you live or die by their opinions and habits. This opens a whole world of design disciplines alongside visual design (User Experience design, User Research, Interaction Design, Information Architecture and prototyping to name a few) and as a product designer for a small company you need a knowledge of all of these to be truly useful. Plus there’s the additional soft skills of time and project management, prioritisation and data analysis that can only be learnt the hard way. There may feel like a hundred designers for every job going when you’re looking, but we find that of those hundred designers very few are the ’T shaped’ people that we look for. In fact our most successful route when hiring is often referrals, just because cold-interviewing brings in such a variety of different types of designer. So how do you go about changing your skill-set if your current job or course isn’t teaching you half of the skills you need to succeed? There are of course a multitude of resources online, as well as courses that will help you learn. But at Osper we believe in learning by doing and anything theoretical seems one step removed from the stuff you care about — namely your own work. At university I remember being set the challenge of coming up with 30 treatments of an idea in 30 minutes, drawn on a 5x6 grid of squares. So for example if your theme was ‘Apples’ you would probably draw an apple in the first square. By your 6th square you’d be on Steve Jobs, and by the 15th you’d be stuck. Pushing through that barrier was where the good ideas lay. As an analogy I think it holds true that if you start and finish a piece of work inside a day, you’ll probably only come up with a single solution and execute it. You’ll have no time (or need) to iterate on, test or validate your work, so who really knows if it’s any good? How about taking on something altogether more scary. 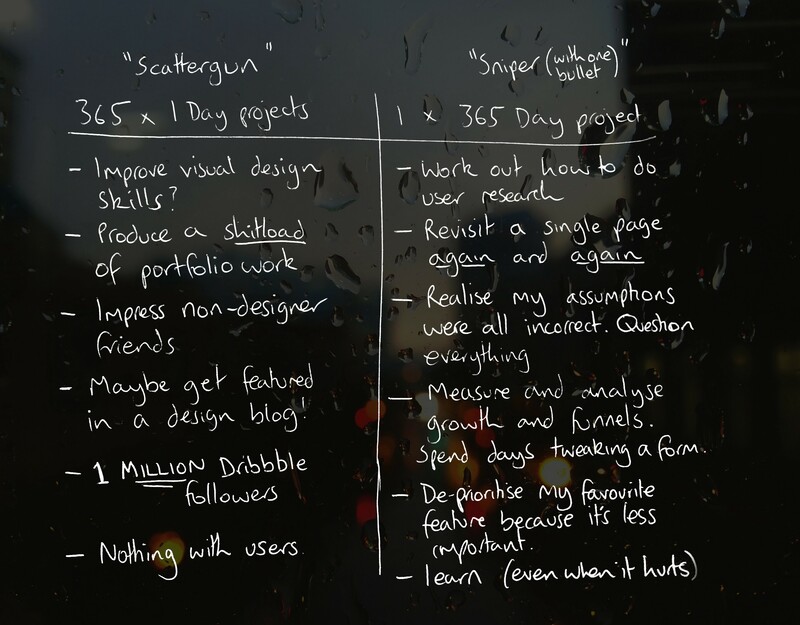 Rather than splitting your year into several small projects: Commit to a single side project that has to last a year. be something for real people, not just for yourself or your portfolio. be able to prove itself in the real world, with measurable results. survive after the initial ‘honeymoon period’ when you (for example) have to spend days building email newsletters. potentially have legs beyond that first year and turn into something bigger, as that’s what will keep you going. Whoa nelly! but I’m a commitment-phobe and this all sounds like hard work! Well, yes and no. Doing one day projects is fine and safe (after all if someone doesn’t like it it doesn’t matter, you only did it as a doodle anyway). Taking something on for a year requires a level of commitment that induces a monster *fear of failure. *But if you care about it more, so will other people. In return for your time you’ll be rewarded by a far better understanding of the full stack of design in a product company and a project with much more meaning and worth. You have a real excuse to hit up your design idols for advice and you never know, you may even make a bob or two. And just think, a year may sound scary, but taken one day or one week at a time it’s no different to a series of smaller projects, it’s just that each one builds on the last. The best thing about doing this will be the story you can tell to a potential future employer, investor or co-founder. Whether your idea was a success or a failure, you’ll know why and you’ll have the battle scars to prove it. Believe me, it’s completely invaluable. Of course, it’s possible you won’t enjoy it at all. That’s fine too, it’s better to find that out in your own way than make a big leap into the unknown when theres a career/mortgage/baby clothes riding on it. Everyone’s got a big idea in them. Bite the bullet. Sink or swim, you’ll learn a hell of a lot. What is Product Design? — huge hat-tip to Eric Eriksson for this great definition. GDS Design blog — one of the best web products about today, run by the UK Government and making government services easier for everyone. Flinto — Of the multitude of prototyping tools I’ve used this is the easiest and the one I keep on coming back to (and my friend Kam wrote a great how to guide here). For mobile prototyping only though.